Philippians 2:5-8: Your attitude should be the same as that of Christ Jesus: Who, being in very nature God, did not consider equality with God something to be grasped, but made himself nothing, taking the very nature of a servant, being made in human likeness. 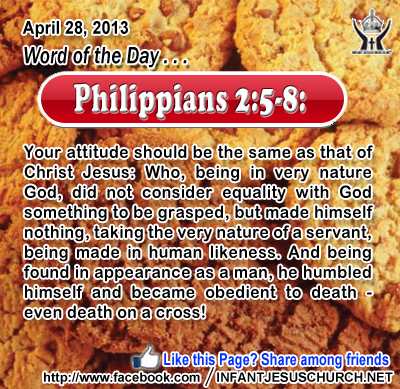 And being found in appearance as a man, he humbled himself and became obedient to death - even death on a cross! Heavenly Father, you are all powerful and yet you emptied yourself to save us. May we be more selfless in our attitude and treatment of others, more like Jesus is with us. In Infant Jesus name, we pray. Amen. 31When he had gone out, Jesus said, "Now is the Son of man glorified, and in him God is glorified; 32 if God is glorified in him, God will also glorify him in himself, and glorify him at once. 33 Little children, yet a little while I am with you. You will seek me; and as I said to the Jews so now I say to you, `Where I am going you cannot come.' 34 A new commandment I give to you, that you love one another; even as I have loved you, that you also love one another. 35 By this all men will know that you are my disciples, if you have love for one another." There is no greater proof of God's love for us than the Cross of Jesus. In the cross we see a new way of love - a love that is generous and selflessly oriented to serving others for their good, and a sacrificial love that is forgiving, compassionate, and compassionate beyond comprehension. Jesus commands us, his disciples, to love one another just as he has loved us. How can we love our neighbor selflessly, sacrificially, and with compassion? Through the victory of the cross and resurrection of Jesus, we now have full access to God's limitless mercy, grace, and power to love and forgive even those who cause us sorrow and suffering. God gives us new abundant life in his Holy Spirit and he fills our hearts with the mystical gifts of faith, hope, and love. Paul the Apostle reminds us that "God's love has been poured into our hearts through the Holy Spirit which has been given to us". As we turn to God with trust and obedience, he transforms our hearts and frees us from our hurts and prejudice so that we can freely choose to love others with sympathy, kindness, and mercy. The Lord Jesus has set us free from slavery to fear, sin, and prejudice. We are now free to choose for his way of love and holiness. Do we seek to bring glory to God in the way you love and treat others? Loving Jesus, your love knows no bounds and your submission to the Father reverses the curse of our pride and disobedience. May we bring you glory in the sacrifice of our will to the will of the Father and in our love and compassion for others, both for those who treat us well and for those who cause us grief or harm.